President Obama, who praised Egyptian President Mohamed Morsi for brokering a cease-fire between Israel and Hamas, has not spoken to the Islamist since his alarming power grab, a White House spokesman said Monday. One day after Arizona Sen. John McCain appeared on the Fox News Channel and called on Obama to renounce the decree by Morsi putting himself above the law, White House spokesman Jay Carney repeated the State Department’s muted call for Egyptians to work out their “internal” problems. “We call for calm and for all parties to work together to resolve their differences peacefully,” Carney said. “We’ve raised concerns about it,” Carney added later. “We are constantly monitoring developments in Egypt and working with the Egyptians, with whom we have a very close relationship.” But asked point blank if the White House “condemned” Morsi’s move, Carney stopped short. “We are concerned about it and have raised those concerns,” he said. Carney said Obama has not spoken with Morsi since the Islamist Egyptian president helped achieve a truce between Hamas and Israel, but said Obama’s recent praise of Morsi was limited to those efforts. 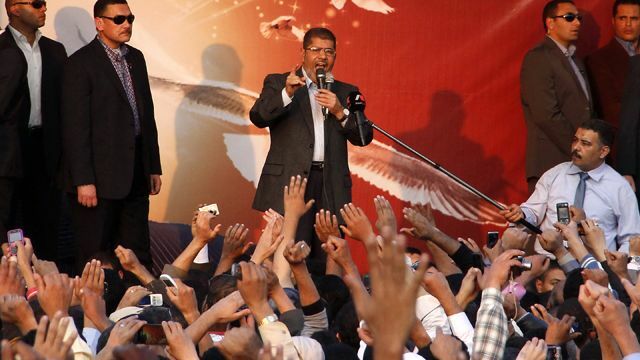 Morsi last week declared himself and the two legislative bodies dominated by his Muslim Brotherhood to be above the reach of the nation’s judicial branch. The judiciary responded by calling the decrees an “assault” on the branch’s independence. Judges and prosecutors stayed away from many courts in Cairo and other cities on Sunday and Monday. There were conflicting reports on Monday about whether Morsi had softened his stance in a meeting with members of the Supreme Judiciary Council. A television network allied with his party said Morsi had agreed that most of Morsi’s actions would be subject to review by the courts, but ensured that the constitutional council could not be dissolved by the courts before it finishes the document. But later, Reuters reported that a Morsi spokesman said his initial decree had not been amended in any way. In Cairo’s Tahrir Square, tens of thousands of protesters camped out on Monday, demanding Morsi reverse his seizing of near-absolute powers. The protests could unravel the stability brought after political protests ousted President Hosni Mubarak and this summer put Morsi into power through a democratic election. McCain said on Sunday the U.S. should demand that Morsi abandon his new powers, and should use American leverage to ensure that he does. “First we must condemn it,” McCain, the ranking Republican on the Senate Armed Services Committee, told “Fox News Sunday.” “Then we can outline what actions might be taken.” “This kind of power is not acceptable to the United States,” McCain said. “Renounce the statement and the move that (Morsi) just made.” McCain said the United States has leverage in trying to persuade Morsi to step back because it provides Egypt with billions in financial aid, in addition to forgiving its debt and supporting an International Monetary Fund deal.